In less than 30 minutes you can have homemade Instant Pot Chicken Marsala that is worthy of restaurants. With a few tricks, the Instant Pot creates the most flavorful Chicken Marsala sauce you have ever had. If you don’t have an Instant Pot, be sure to check out my stove top version of Chicken Marsala. 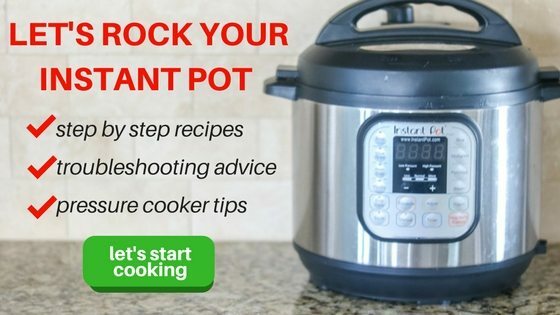 Or browse through Instant Pot Recipes, for more recipe ideas. 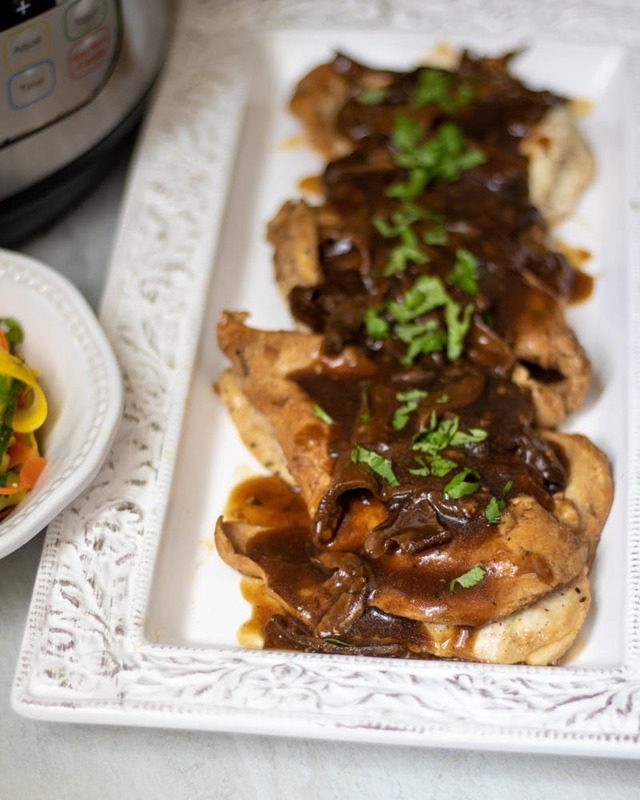 A few weeks ago, a reader asked me if I had a recipe for Chicken Marsala for the Instant Pot. She had tried another recipe and was not wowed by the flavor, but loved my recipe for Chicken Marsala on the stove-top, she was hopeful I could create a version of the pressure cooker. Challenge accepted. 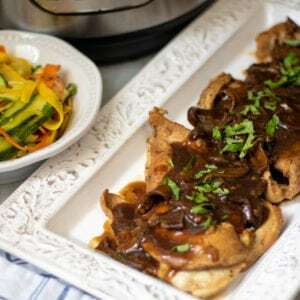 And I was blown away to see that one of the secrets that makes my traditional Chicken Marsala so incredibly rich and good, could be implemented in the Instant Pot in less than half the time. I have always used dried mushrooms when making my Chicken Marsala. I let the mushrooms soak in hot water for at least a couple hours, if not overnight. The mushrooms soak up the liquid and become soft and tender, while they create a delicious mushroom broth that I use in my Marsala Sauce. Guess what? No pre-soaking is required when using dried mushrooms in the Instant Pot. Simply throw them in and the pressure cooker work it’s magic. And friends, those dried mushrooms are the secret to the BEST Chicken Marsala. The mushroom broth and flavor from wild mushrooms is unbeatable. People are always impressed with this Chicken Marsala Recipe, but it is seriously incredibly easy to make. You can just keep that our little secret and wow your friends with this impressive chicken recipe! For tender Chicken Marsala, you want to have thin chicken cutlets or boneless, skinless chicken breasts that have been pounded thin. Or place boneless, skinless chicken breasts in a gallon size bag with a tablespoon of water. Seal bag and pound chicken breasts thin with meat mallet, or bottom of a heavy pan. Heat your pressure cooker by hitting the Saute function and waiting until Instant Pot reads, Hot. Add 1 tablespoon olive oil to inner pan of pressure cooker. Season chicken breast cutlets generously with salt and pepper. Sear chicken breasts 2 to 3 at a time for 1-2 minutes per side. Remove browned chicken breasts to plate. Once the chicken is seared, it is time to make the sauce for the Chicken Marsala. Add in a dash more oil to inner pan of Instant Pot if no oil remains after searing chicken. Add in a diced shallot to the Instant pot. Add in the Marsala Wine and deglaze the pan, by scraping up any browned bits of shallot or chicken off bottom of the pan. Add in beef broth and the dried mushrooms. Return browned chicken back to Instant Pot and submerge in sauce. Place lid on the pressure cooker, turn valve to sealed and set Chicken Marsala to cook on high pressure for 5 minutes. Remove chicken breasts to serving platter. Turn off Instant Pot and then turn back to Saute. Whisk in a cornstarch slurry and stir constantly, until sauce is bubbly and thickened–about 3-4 minutes. Pour sauce over chicken cutlets. Cornstarch will help thicken up this Chicken Marsala while keeping this dish gluten-free. To make a cornstarch slurry for Chicken Marsala, whisk together 2 tablespoons beef broth (or water) with 1 tablespoon cornstarch. Whisk well to get out all lumps before adding to Chicken Marsala Sauce. I love using dried mushrooms, in this Chicken Marsala Recipe, as they are the key to incredibly flavorful sauce. However, if you can’t find dried mushrooms, you can use sliced baby bella mushrooms and saute along with the shallots. If you use FRESH mushrooms, decrease beef broth from 1 cup to 2/3 cup as the fresh mushrooms will give off more liquid than dried mushrooms. Be sure to rinse your dried mushrooms before adding to your sauce, to remove any grit, sand or dirt from the wild mushrooms. Be sure to use a good quality dry Marsala Wine for this Chicken Marsala recipe. I use beef broth to add extra flavor to the Chicken Marsala sauce, but you can use chicken stock if you’d like. 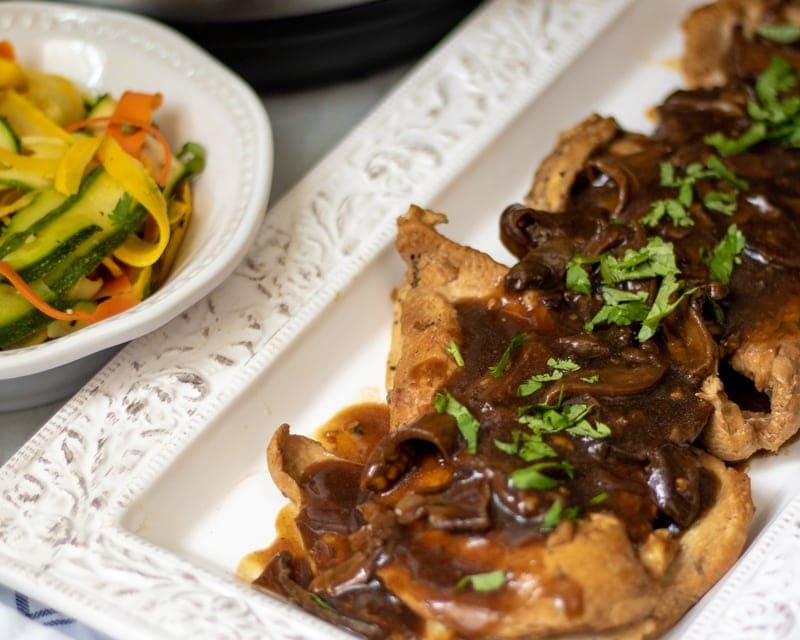 Feel free to finish your Chicken Marsala with a tablespoon or two of butter to make the sauce even richer–just remember it will no longer be a Dairy-Free recipe. In less than 30 minutes you can have homemade Chicken Marsala that is worthy of restaurants. Add tablespoon olive oil to inner pan of pressure cooker. Sear chicken breasts 2 to 3 at a time for 1-2 minutes per side. Remove browned chicken breasts to plate. Add in 1 cup beef broth and the dried mushrooms. Once cook time has elapsed, let pressure release naturally for 5 minutes (this helps to keep the chicken from getting tough). Then release any remaining pressure. Whisk together cornstarch with 2 tablespoons reserved beef broth. Whisk in a cornstarch slurry and stir constantly, until sauce is bubbly and thickened--about 3-4 minutes. Either purchase boneless, skinless chicken breast cutlets (sometimes labeled thin sliced) or place boneless, skinless chicken breasts in a gallon size bag with a tablespoon of water. Seal bag and pound chicken breasts thin with meat mallet, or bottom of a heavy pan. I love using dried mushrooms, in this Chicken Marsala Recipe, as they are the key to incredibly flavorful sauce. However, if you can't find dried mushrooms, you can use sliced baby bella mushrooms and saute along with the shallots. If you use FRESH mushrooms, decrease beef broth from 1 cup to 1/2 cup as the fresh mushrooms will give off more liquid than dried mushrooms. I use beef broth to add extra flavor to the Chicken Marsala sauce, but you can use chicken stock if you'd like. Feel free to finish your Chicken Marsala with a tablespoon or two of butter to make the sauce even richer--just remember it will no longer be a Dairy-Free recipe. Ah yes Tiffany, that would account for it for sure–those fresh mushrooms do let off a lot of moisture. I will update my notes to warn people of that. In the future, 1/2 cup would probably be a good starting point. If you struggle to thicken again, take out a few tablespoons of the liquid and whisk in 1 tablespoon cornstarch, then whisk that mixture back into your instant pot and let cook until thickened. This recipe was delicious and simple to make. I did use 2.5 lbs of chicken so changed the proportions and added more beef broth to make more sauce. I used shitake dried mushrooms which absorbed the sauce beautifully. Thank you! YAY!!! I love hearing this! Thank you for taking the time to let us know how your family enjoyed! Tried to watch the video but Ads literally interrupted every 5 second. I don’t mind an ad here or there, I get it. . But literally …every. Five. Seconds. I will contact my ad company about that. Sorry!! That should not be playing ads that often.